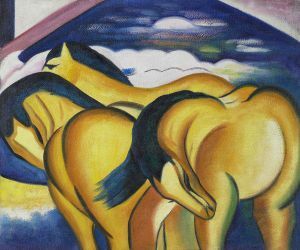 Franz Marc (February 8, 1880 – March 4, 1916) was one of the principal painters and printmakers of the German Expressionist movement. 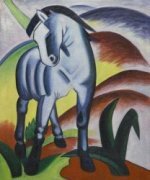 He was a founding member of "Der Blaue Reiter" ("The Blue Rider"), an almanac the name of which later became synonymous with the circle of artists collaborating in it. Franz Marc was born in 1880, in the German town of Munich. His father, Wilhelm, was a professional landscape painter, and his mother Sophie was a strict Calvinist. In 1900, he began to study at the Academy of Fine Arts, Munich, where his teachers would include Gabriel von Hackl and Wilhelm von Diez. In 1903 and 1907 he spent time in France, particularly in Paris, visiting the city's museums, and copying many of the images. In Paris, he frequented artistic circles which brought him into contact with a number of artists, including Sarah Bernhardt, and he discovered a strong affinity for the work of Vincent van Gogh. In this period, Marc was involved in a number of stormy relationships, including a years-long affair with Annette von Eckardt, a married antiquary nine years his elder, and two marriages, first to Marie Schnuer, then to Maria Franck. In 1906, he traveled with his brother, a Byzantinist by trade, to Saloniki, Mount Athos, and various other Greek locations. Marc developed an important friendship with the artist August Macke in 1910. In 1911 he formed the Der Blaue Reiter artist circle with Macke, Wassily Kandinsky, and other artists who decided to split off from the Neue Künstlervereinigung movement.